This post has already been read 2487 times! KEARNEY – The future of science, technology, engineering and math education is beginning to take shape on the University of Nebraska at Kearney campus. Following a ceremonial groundbreaking in early May, construction crews have been hard at work at the site of UNK’s new STEM building, a $30 million facility that will promote collaboration and innovation across numerous academic departments. 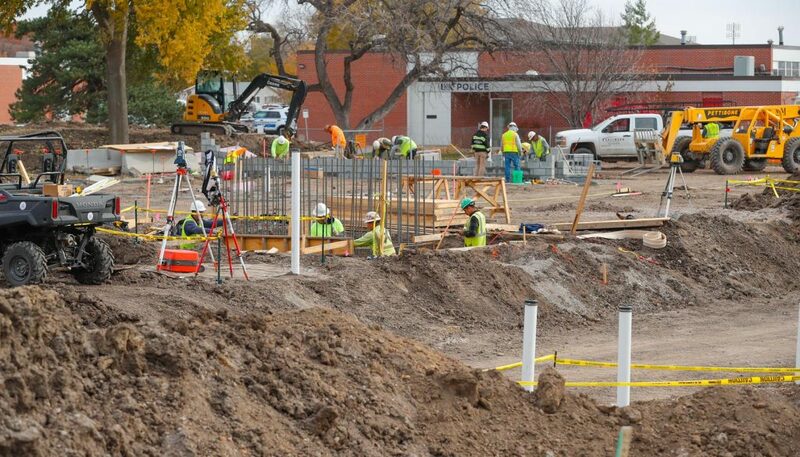 The 90,000-square-foot building is rising on UNK’s west campus between West Center and Ockinga/Welch Hall. Because of its location, the university coordinated with the city of Kearney to permanently close 19th Avenue, which runs along the east edge of the construction site. 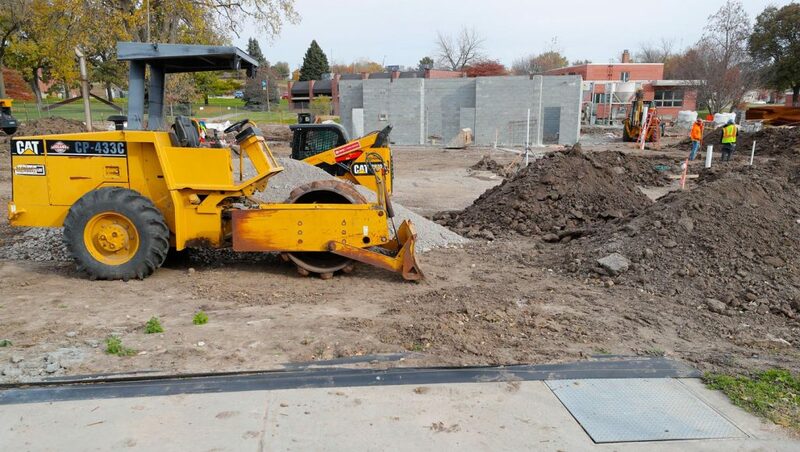 The project, led by general contractor Hausmann Construction of Lincoln, remains on schedule for a fall 2019 completion, despite some wet weather in recent weeks. “I’m impressed with where they are,” McQueen said. 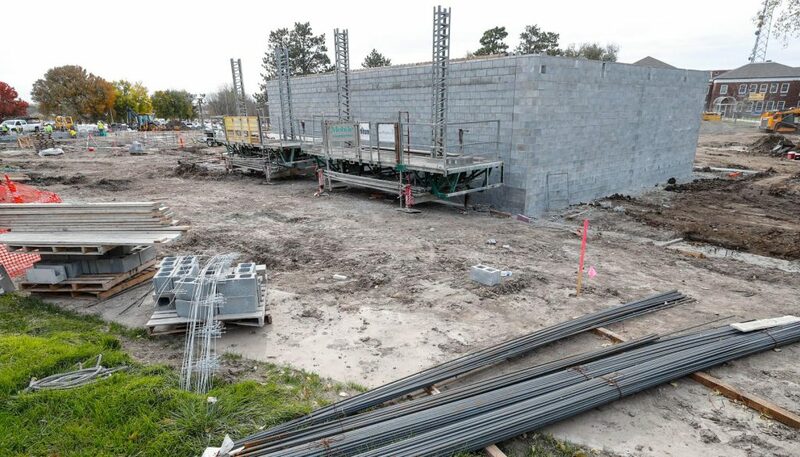 The masonry walls for a storm shelter are nearly complete, and a Geopier system used to reinforce the ground below the building has been installed. Workers have also poured more than 250 cubic yards of concrete footings for the foundation. The to-do list through the end of this year includes the installation of underground plumbing, completion of the footings and an elevator shaft and continued progress on the masonry walls. Steel structural components will also start to go up. The STEM building, which hasn’t been formally named yet, is one of three projects that will replace Otto C. Olsen, a 63-year-old building that has been on the state’s capital construction replacement list for more than 20 years. Most of the departments currently housed in Otto Olsen will move to the STEM facility. Those include construction management, industrial distribution, interior design, aviation and cyber systems. Mathematics and statistics are relocating there from Warner Hall, and physics and astronomy and engineering are shifting from Bruner Hall of Science. The state-of-the-art STEM facility will feature cutting-edge technology in an environment that allows students and faculty to share ideas and research that advance UNK’s mission and benefit the entire state. Location: West of 19th Avenue between University Drive and U.S. Highway 30. It is on the west end of UNK’s campus, northeast of West Center and south of Ockinga/Welch Hall. Funding: It is paid for by renewal bonds and through state appropriation from LB858, the University of Nebraska Facilities Program of 2016. That appropriation directed deferred maintenance funding to facility replacement projects, including the Otto Olsen building. Academic departments: Construction management, industrial distribution, interior design, aviation, cyber systems, mathematics and statistics, physics and astronomy and engineering will be located there.